Hot dog fans, take heed: there's a new spot in town to get your fix. The newcomer to Santa Monica, called Sumo Dog, is located at 1315 Third St. Promenade, Suite G, in the Gallery Food Hall. Formerly situated in Koreatown, the popular Coachella and music festival go-to has since relocated to Santa Monica, Eater LA reports, boasting the same popular Asian fusion hot dogs and new offerings to boot. On the menu, look for specialties like the Kimchee Dog with mayo, wasabi, furikake, scallions and housemade kimchee; and the Bacon Banh Mi burger with pickled daikon, spicy mayo, jalapeno, cilantro and more. With a 4.5-star rating out of five reviews on Yelp so far, Sumo Dog has been warmly received by patrons. 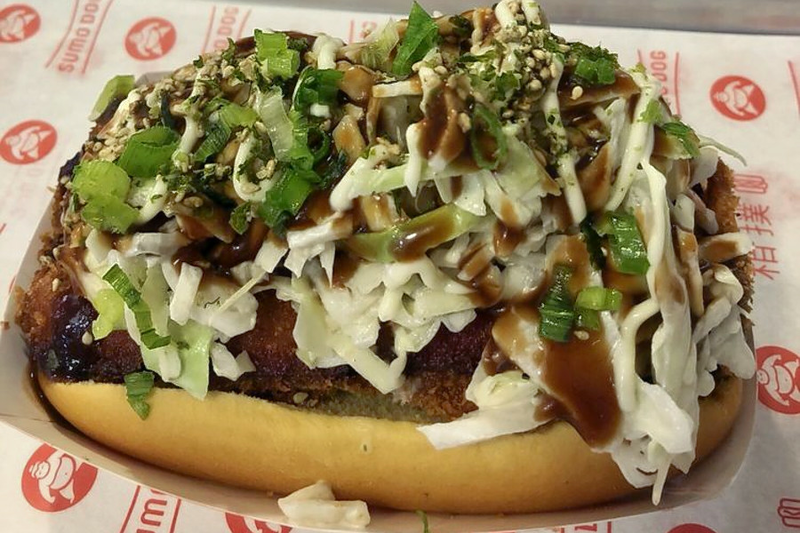 Eric N., who was among the first Yelpers to review the new spot on Sept. 10, wrote, "My co-worker and I both got the Katsu hot dog and I got a side of tater tots with the furikake seasoning. Nothing was a disappointment at all!" "Yes, love the Asian flair to these loaded hot dogs," wrote Yelper R W. "The sushi rice tater tots were delish too." Head on over to check it out: Sumo Dog is open from 11 a.m.-9 p.m. on Sunday-Thursday and 11 a.m.-10 p.m. on Friday and Saturday.